3 reasons you won’t see mass produced 3D printed running shoes – for now. 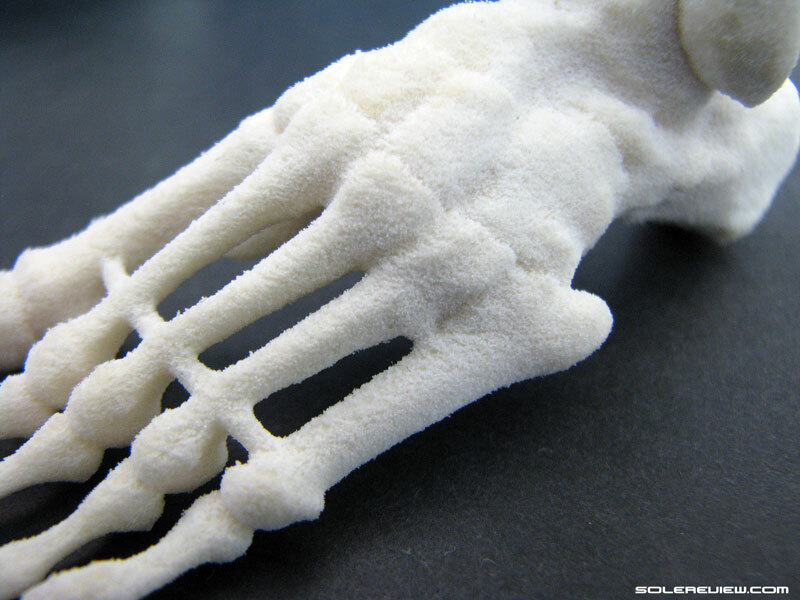 A flexible model of the skeletal human foot, produced by the SLS 3D printing method. If popular perception is anything to go by, then consumer 3D printing is the next big thing. The widespread press coverage on the subject makes one envision a future where millions of consumers could print their own trinkets and what-not using their personal 3D desktop printer. Dozens of upstart companies have jumped into the 3D printing fray, including ones from the culinary industry. Here’s a company which makes 3D printed Pizzas and other dishes – all perfectly edible, of course. But is widespread consumer adoption ever going to happen, if at all? Even a basic consumer 3D printer costs more than a thousand dollars, which is a lot of money for printing miniature Eiffel Towers. Of course, it might be of immense use for hobbyists, educational institutions, professional modelers and their kind, but for you and me? The need is questionable, to say the least. Recently, the athletic footwear industry thought it would be a great idea to wave around a few shoes with 3D printed midsoles. It’ll be good press after all, and another opportunity to say awesome things like the ‘unveiling the future of performance footwear’, or ‘ the future of running is here’. We’re obviously talking about adidas and New Balance, though New Balance actually managed to deliver the shoe earlier this month. A pair of Fresh Foam Zante V2 with a 3D printed midsole (at $400) made its limited run debut on April 15th. Many think the entire shoe to be 3D printed; that’s not true. The upper is still manufactured using the old-school way like any other shoe. The 3D printed midsole is attached to the upper using a traditional sole pressing machine. Exactly like your $100 made in Vietnam Zante V2. So the question is: can these 3D printed midsoles be a substitute for mass produced injection and compression molded midsoles? The short answer is no. For reasons that follow shortly, you won’t see your $100 shoe upper glued to a 3D printed midsole in the foreseeable future. 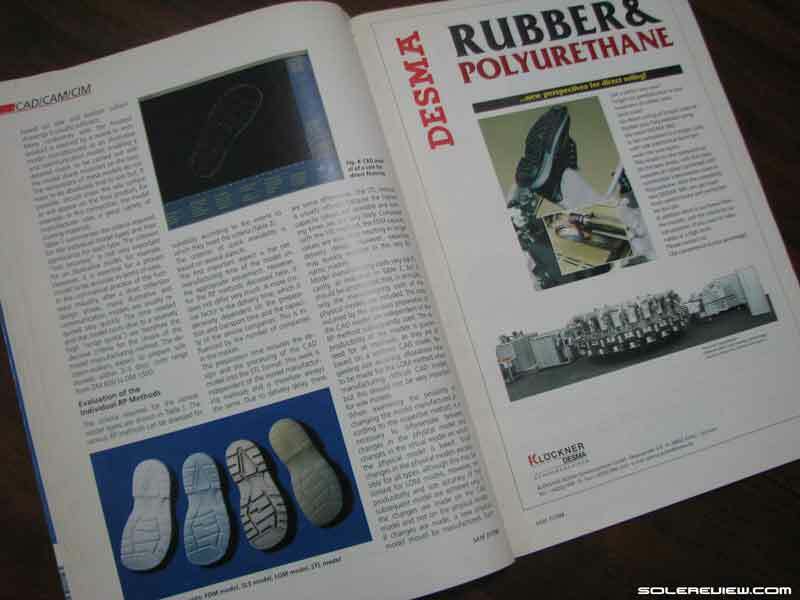 This is from a now out-of-circulation 1998 (not a typo) footwear manufacturing magazine. At the bottom left are 3D printed examples using the FDM, SLS and STL (now called SL) methods. But before we get into our list, we’ll do the history bit first – because it’s here where things gets interesting. The footwear industry has been using 3D printed footwear parts for nearly two decades now. The reason why very few know this is because 3D printing has always happened in the background instead of selling it in form of a consumer product. Say you’re a footwear designer. You start with a sketch or concept – which could be on paper or in digital form – and want to see that translated into a prototype in mesh and foam. So you develop paper patterns (manually or digitally) based on the last, which in turn helps create a stitched shoe upper. Then there’s the problem of making the midsole and outsole. So you do it the hard way; make a metal mold based on the computer drawings, and eventually procure a compression or injection molded sole unit. Finally, after several weeks of waiting (sometimes more), you get to see the initial sample for the first time. You’ll point out where corrections are needed, and then starts the process of producing the next (improved) sample all over again. But what if there was a way to speed everything up, and get a look-see sample in a few days instead of weeks? In other words, what if you had a rapid prototyping process? In came 3D printing to the rescue. Since the mid-nineties, footwear brands – athletic or otherwise – have relied on 3D printing as a ‘rapid prototyping’ (RP) tool, allowing them to bring their concepts to life much faster than conventional sampling techniques. One could print an entire shoe (not wearable, though), or you could go as far as to create metal molds out of which real foam midsoles or rubber outsoles can be produced in limited numbers – hence bypassing the lengthy process of creating production molds. We were truly awestruck when we first saw a 3D printed part around 17 years ago. It was pure magic, a solid form buried within a vat of powder. Did we say powder? How does that work, exactly? 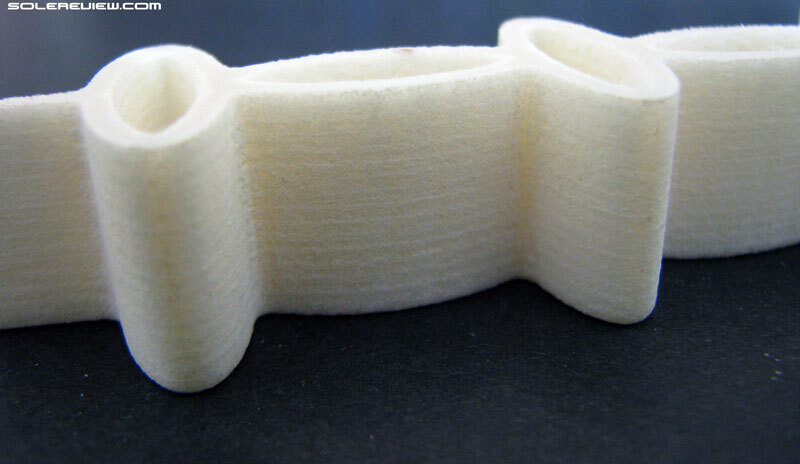 All 3D printing models requires the material to be formed layer by layer. Hence the name ‘additive manufacturing’. In this example of a SLS printed part, you can literally see the layers stacked over one another. 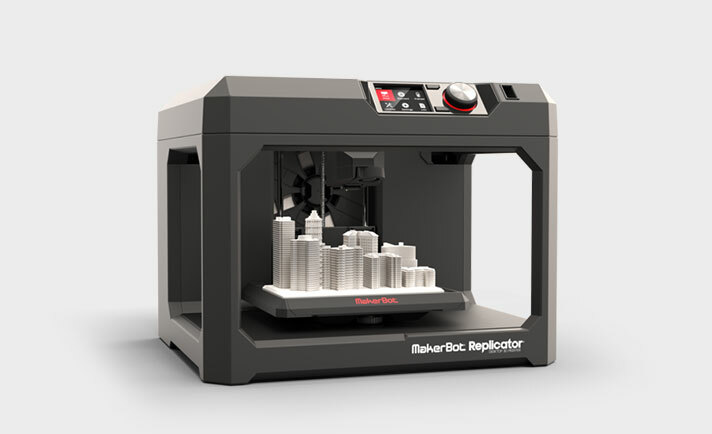 3D printing is also known as additive manufacturing. Sounds very complicated, but the basic principle is ridiculously simple. You start with a single layer of material, and then keep adding layers over it till you get the required shape. Computer hardware, software and/or lasers are involved, but those are just means to an end. Picture a deck of cards. You first drop a single playing card on a table, then add the second card over it, and so on till you exhaust all 52 cards. In the end, you have a 3D block of playing cards. 3D printing is similar, except for the fact that all the playing cards will be fused to one another in the form of a permanent block. The picture above is a good example of a vertically stacked 3D part. There are three major methods of 3D printing (there are more, but these are the commonly used ones) – FDM, SL, and SLS. FDM stands for Fused Deposition Modeling. It just means that a liquid/molten material (like plastic) is dropped over a surface, and then the process is repeated till many layers are joined vertically together to result in a shape you want. The entire process is controlled by computer software. Think of it like getting someone’s sugar frosted name on a birthday cake. You use a bag of plastic or squeezer filled with liquid frosting, and then run it over the cake to get the name right. You also know that little Johnny is going to be unhappy if his name is not spelled big enough on the cake. So you wait for the first layer to dry, and then apply another layer of frosting. You repeat this process till you have several layers of tasty frosting over the cake, and Johnny’s name is three dimensional enough for him to be happy. FDM works like the cake frosting analogy, except that instead of the sugary syrup, you have molten plastic. And instead of your hands, it is a computer controlled extruder or nozzle writing Johnny’s name in 3D. FDM is what’s used in mainstream (consumer) 3D printers, the ones which you can print toy Eiffel towers and plastic jewelry out of. SL works in an entirely different manner than FDM. You begin with a tub of liquid polymer. A laser ‘draws’ over liquid surface, hardening the polymer into a solid form. The laser does the same thing again over and over again, which creates the shape you desire. An important thing to note here is that unlike the FDM method, where the plastic is dropped on a fixed platform, the hardened SL layer ( the platform which the liquid Polymer is placed over) is lowered with each step so that the laser can create the next hardened layer over it. All this time, the surroundings stay liquid. The laser is targeted in nature, hardening only those areas which are programmed by the computer. After the SL part is completed by the laser, it has to be cleaned of the liquid. 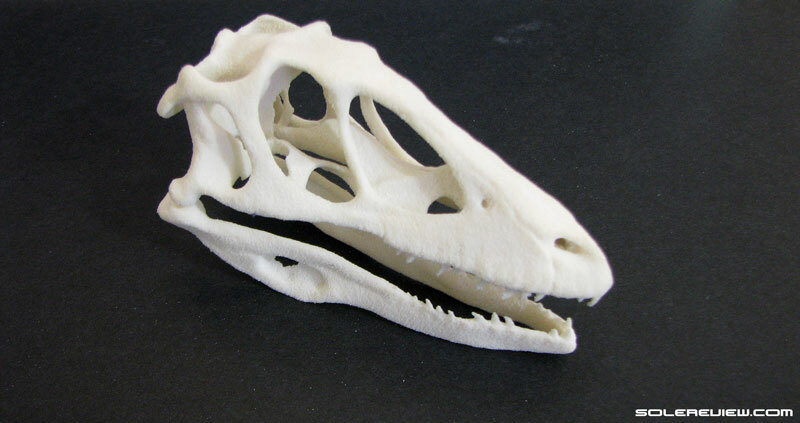 The 3D printing process which created this Dinosaur skull is also used in the footwear industry. This is of relevance to the athletic footwear industry, because this is the 3D printing technique of choice to create footwear parts. It is similar to the SL method, except that instead of the liquid polymer, the 3D printer uses powdered Polymer and binding agents (adhesives). The name (Selective Laser Sintering) itself is descriptive enough. The Laser Selects an area on the powder bed, Sintering (hardening/fusing) it with heat. Easy peasy. So here’s another food example. Let’s say you have a plastic tub full of refined flour. You take a dropper filled with water, and carefully pour a small amount of water over the dry flour in a figure of 8. Water meets flour, and the figure 8 becomes a solid dough while the rest of the tub stays powdery. But you’re not cool with a thin figure 8, and you want the dough to be thick in a three-dimensional sense. You find a way to lower the first layer of figure 8, and then sprinkle more dry flour over it. Then you do the water-dropping thing again, which forms another layer of figure 8 over the existing one. Keep repeating the lowering+flouring+watering process, and soon enough you’ll end up with a three dimensional figure 8 made of dough. When finished, you’ll need to dust off the excess flour sticking to the solidified dough. 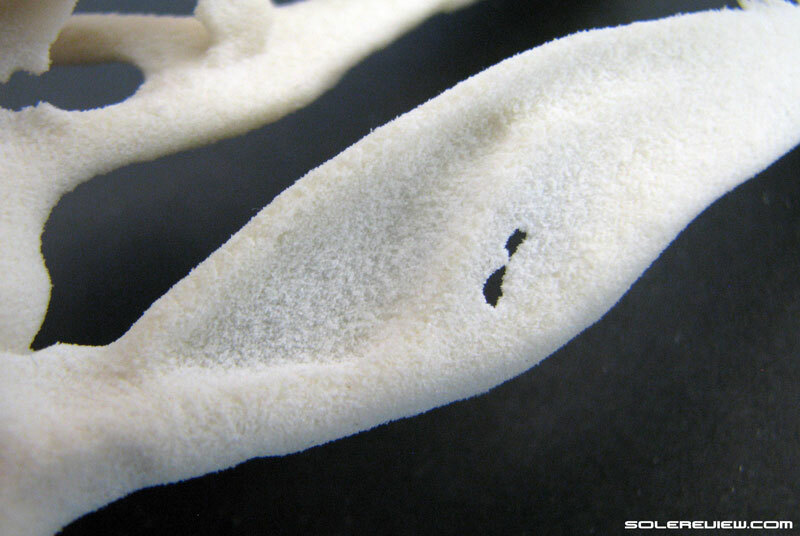 All flexible SLS parts have a powdery residue, which needs to be blown away using compressed air jets. SLS printing works in exactly the same way. In the example just described, replace the water with laser, the hand-held water dropper with a computer controlled arm, and the flour with powdery polymer. And much like the dough example, the 3D printed part needs to be cleaned of the polymer powder when the process is complete. You can see video examples of SLS printing here, here and here. For a long time, SLS printing only yielded rigid parts. These were easily prone to chipping/breaking. For the first decade, the footwear industry relied on rigid and brittle SLS parts. Meaning that they were extremely fragile; drop a 3D printed part, and off shattered your precious sample into many pieces. So footwear developers travelling to the Far East had to wrap these SLS parts with extreme care for it to last the 20 hour plane ride. One usually avoided checking these in while flying. This meant that if you were travelling out of the United States, you often had to initiate the bewildered TSA agent at the airport security into the strange yet marvellous world of 3D printing. 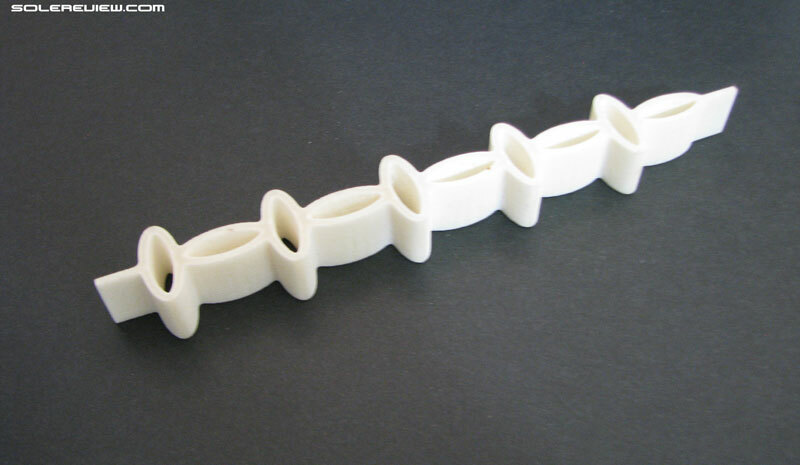 A decade ago, the 3D printing industry discovered a way to make SLS parts flexible. 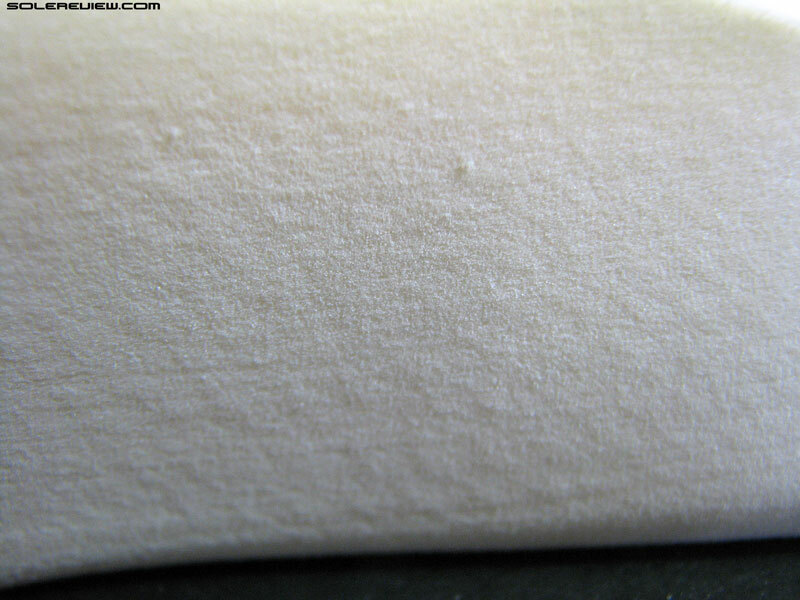 A material which felt like a dense foam midsole, and did not crumble or chip when dropped. And that is what you see today, in form of the $400 New Balance Zante, or the ‘statement of intent’ adidas Ultra Boost with its 3D printed midsole. 3D printing in the footwear trade is far from a gimmick; its use in rapid prototyping has been invaluable. It has made the development process much more efficient compared to what it used to be once. 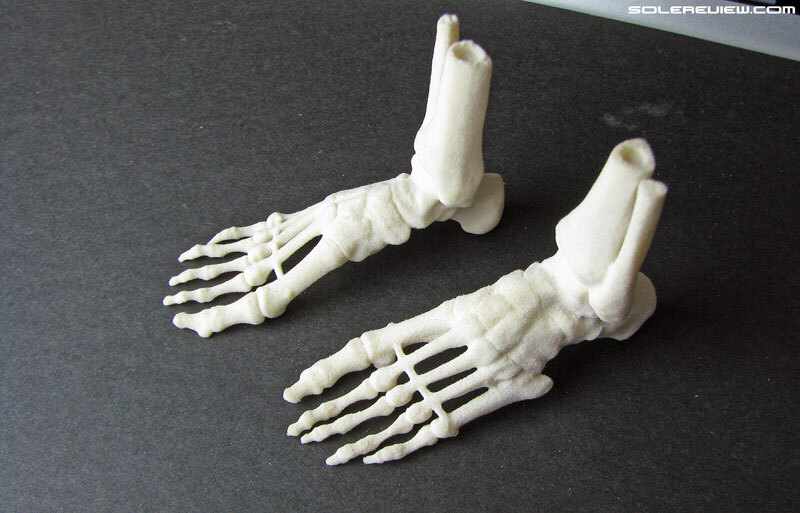 The 3D printing process is also useful for creating customised footwear products, like tailor-made running spikes, medical orthoses/inserts or orthopaedic shoes for example. However, with the recent hype around 3D printed footwear product, one might be fooled into thinking that shoes with 3D printed midsoles are going to be widely available to consumers, and soon. The conventional logic is that as more people adopt 3D printed footwear, one will benefit from economies of scale, which in turn makes the process efficient and the costs lower. Here’s the thing though: In its current form, industrial scale is the enemy #1 of SLS 3D printing. One might argue that the 3D printing tech will rapidly evolve to become suitable for large scale production. But remember that the 3D printing technology which we see on the Zante and adidas shoe today has been around for 20 years. Which means that the tech hasn’t moved forward at all, except for improvements in the formulation of the flexible powder itself. Most people in the know link the stagnation in 3D printing innovation to fiercely protected patents held by a few parties with a monopoly. We hope that is the case, and the expiry of patents (which has already happened for most of the 3D processes) will spur innovation. In the time it takes to print this midsole, you can compression mold dozens of pairs if not more. Unlike an injection or compression molded midsole which takes just a few minutes to produce, watching a SLS 3D printer work its craft is like watching paint dry. Even by New Balance’s own admission, the printer takes several hours to make a single midsole. Shoe factories are very efficient, making sure that the making of the shoe upper and midsoles are perfectly synchronized as to enable final assembly and shipping of shoes. Needless to say, the snail speed of 3D printing will create a huge production bottleneck when high pairage is involved. Also, longer time equals higher costs, and that is why the Zante costs $400 instead of $100. And we’re pretty certain that price is subsidized. The bottomline is – it takes a long time to produce 3D printed midsoles, and there’s further post processing involved. Both of which are hindering factors when it comes to economics of scale. Laser meets SLS powder+binder. Hello, powdery texture. This is what most SLS Duraform based footwear parts will look like. Rough texture. Elastomeric SLS 3D printing fails miserably when it comes to sidewall detailing. The regular Zante has a honeycomb like design on its midsole; while this is a simple task for injection or compression molding, it ends up being a herculean feat for 3D printing. Laser beams and soft foam powder aren’t exactly drinking buddies, so when the two meet the finished part ends up with a powdery texture. Color is another aspect. It is possible to have multiple colors in a rigid SLS part, and it stands to reason that flexible parts are also capable of doing the same. But the colors are dull, a far cry from what traditionally molded midsoles can deliver. 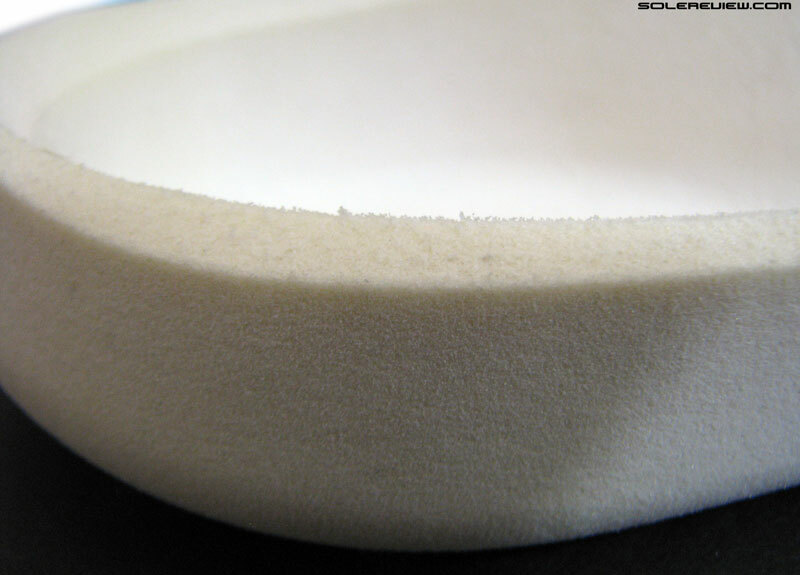 The grainy texture is a result of the powder sticking to the surface of the sintered (fused) part. 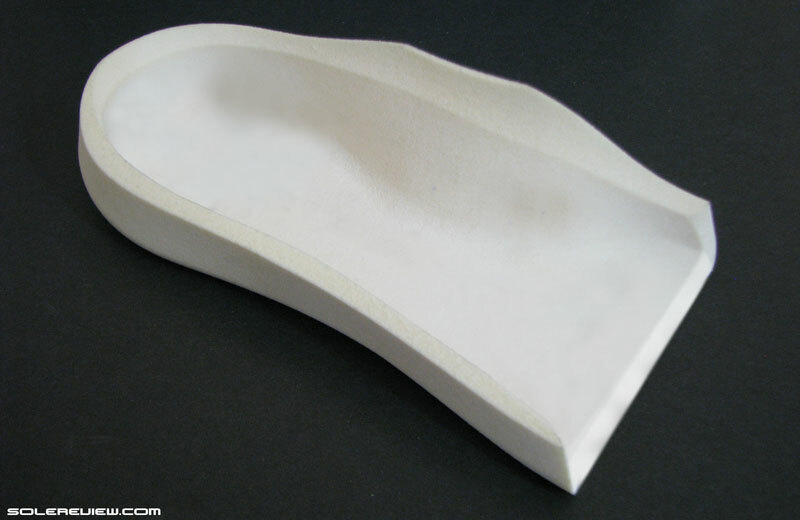 A solid SLS printed, flexible midsole part. Volume for volume, it is much heavier than EVA. When used as customization tool, SLS 3D printing has an edge over molded parts. Like adjusting the midsole’s dimensions to the specifications of the individual, or creating different cushioning zones within the same midsole by means of design variation. For instance, a certain section of the 3D printed sole could have a latticed structure while leaving other areas densely packed, creating two different levels of cushioning. But take that aspect away, and as a mass produced industrial product, a 3D printed midsole has no advantage over traditionally made parts. Volume for volume, solid SLS parts are way heavier than EVA variants. Then there’s the matter of 3D printing cost, making each part much more expensive than its compression or injection molded avatar. And we’ve already covered the small challenge related to the visual quality of 3D printed parts. 3D printing has its place in footwear development, and a very important one at that. It has long proven its usefulness in the behind-the-scenes rapid prototyping, and has immense potential with respect to customized footwear. That said, 3D printing has a long way to go before it becomes an ubiquitous sight in the running shoe industry. For now, be content with molded midsoles and small batches of $400 running shoes with 3D printed midsoles. Is it worth buying one if you can? Maybe. Who knows, the Zante V2 with its 3D printed midsole might become a thing on eBay one day.